The first three months of the year are a busy stretch of the calendar full of activities and events, and it is easy to lose sight of many good things in the midst of the busyness of the year. As the first marking period has ended and we are moving into the winter months, this is a great time to give thanks for so many things that are making this a wonderful school year. First, I am thankful for the support our entire school community has given us with our new technology and cell phone guidelines. 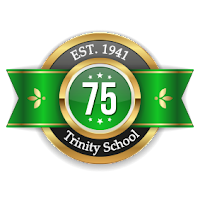 We made a great push at the beginning of the school year to make Trinity a cell-phone free environment for our students, and I have been amazed at how successful this initiative has been to start the year. Removing the phones is helping our students to stay focused and is positively impacting our regular face-to-face interactions. We could not make this happen without the support of our families. I could tell from the large audience that came to the Screenagers movie that technology is a very relevant issue and I thank you for your help in guiding our students. Secondly, we are very thankful for the flurry of shadow students that have been visiting Trinity, particularly in our middle school. Our fifth grade students especially are getting used to hosting visitors, and the number of students shadowing at the beginning of the year has well surpassed the number of shadow students I have noticed in the past two falls. Seeing the delight in the faces of our shadow students reminds me that we have a wonderful school that naturally attracts students and families, and I am grateful for the hospitality of our families, students, and our new admissions director Christine Walsh. I think it is also a sign that you are spreading the word about the good things that happen in our school, as more and more people in our community are taking notice. Additionally, I am very grateful for the hard work of our students to begin this school year. Similar to running a race, starting the school year is not easy, and our rigorous curriculum requires a lot of work for our students. Looking at the first trimester report cards, I see that our students have put in a great amount of work and have accomplished great achievements to begin the year. I also know that this is just one small part of the work that it takes to accomplish great learning, and am grateful for the hours and hours of support that you as parents give to our students and the countless hours that our teachers put in to make this school year successful. As we celebrate the 75th anniversary of our school, take some time to reflect and enjoy the labors of this fall.